Paul Moore lives in Cheshire, England. He is married, with one son. His "day job" is as an Oracle DBA, but he writes C and C++ programs in his spare time. 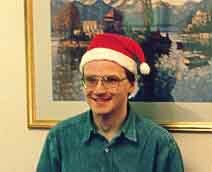 Paul started programming on Acorn's BBC Micro and RISC PC series of computers, but finally went mainstream and bought a PC, on which he now runs Windows and Linux. Paul's main interest is in porting and developing open-source software, and so his main programming language is C (at least until the open source community switches to C++).